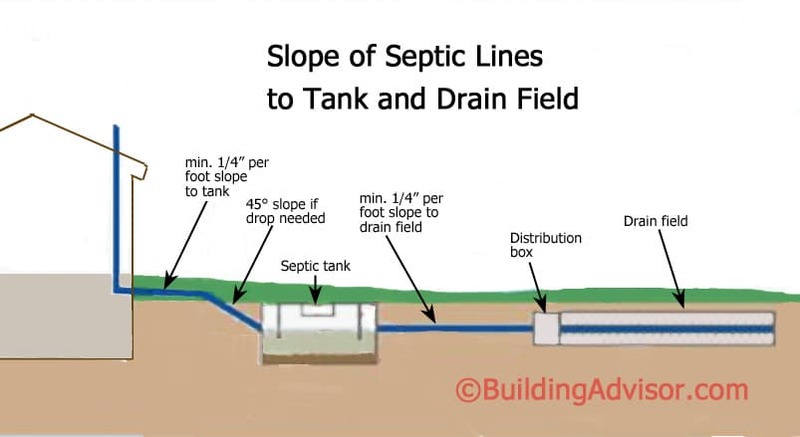 You are here: Home / Building Blog / How Much Slope for Septic Line? Peter asks: My builder just installed our septic system but I’m concerned he did it wrong. It appears that the drain field is at a higher elevation that the outlet of the tank. I don’t understand how the tank can drain uphill. Am I missing something? 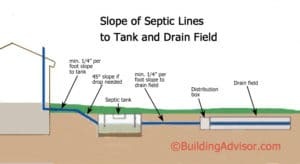 Answer: Unless you have a mound system, or another pumped system with a dosing chamber and lift pump, you are correct that you need a downhill slope in the sewage lines. The tank will not drain uphill to the drain field. The leach lines themselves, however, should be set level. In a conventional gravity system, the pipe from the house to the septic tank, and the outlet pipe from the tank to the distribution box or leach field, should both slope downward with a minimum slope of 1/4 inch per foot. A little more slope is ideal, but there are some concerns that a slope in any plumbing drain of more than 3 inches per foot (but less than 45 degrees) could lead to clogging and this is reflected in some local codes. The concern is that the water will run too fast and leave the solids behind to clog the pipe, but there is little evidence that this actually occurs. There are a variety of pumped system designs that can be used when it is necessary to move the effluent uphill. Pumped systems are usually designed by an engineer or a licensed septic system designer and usually include an alarm system to alert the owner to pump problems. I would recommend getting in touch with the person who designed your system to discuss the problem and inspect the site if possible. If that is not possible, document your observations with photos and measurements, and keep a log of your conversations with the contractor, so you will have good documentation once everything is buried and out of sight. It’s best if you express your concerns to the contractor in writing. Inadequate slope or sags in the drainage pipes can lead to clogs and long-term performance problems. An uphill line like you describe will never work properly. Read more about How a Septic System Works.